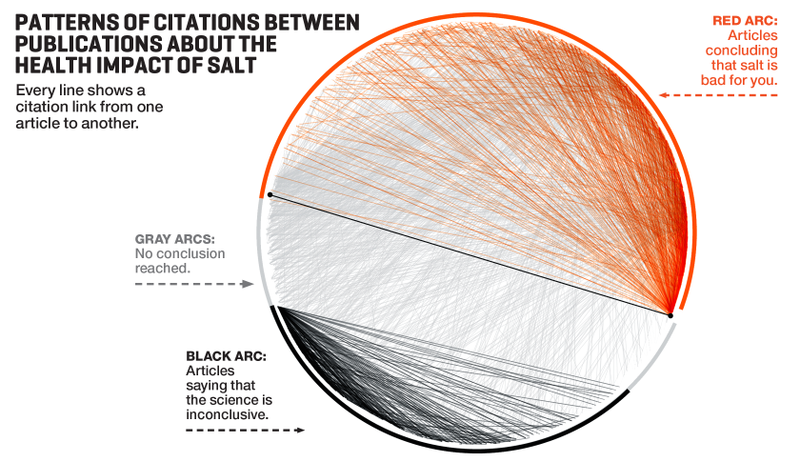 Here is a figure reproduced in Fortune, showing that when researchers publish articles raising questions about the harms of salt, they cite other researchers who raised similar questions. By contrast, when they definitively argue in favor of the harms, they cite other definitive colleagues. Some of this makes scientific sense. If you show a particular phenomenon exists in the real world, you want to show other people who have found similar phenomena. If your evidence supports a specific theory for why the phenomenon exists, you’ll cite other people who’ve laid out those kinds of theories. But there is potentially a nefarious side to this, too. You might only cite like-minded scientists to make your argument look stronger than it is. Or you might cite those scientists because you hope they will become reviewers of your paper, since journal editors might look at your references to decide who to send the article to. Science is a process. Often a very messy one. And the messiest part is often our own underlying biases. Best to be aware of those biases and try to fight them. That will speed along the process.